Over the years, these historical abodes have changed and evolved right along with Sea Island resort. Before The Cloister was a gleam in Howard Coffin’s eye, there were already plans for a cottage colony underway in the surrounding area. The first cottages were built in 1927, a year before the hotel opened. “Howard Coffin understood the importance of combining vacation residences with a hotel that would provide amenities to the cottage owners, such as dining and a beach club,” Sea Island Archivist Mimi Rogers explains about the proliferation of the cottages, whose earliest iterations were modest yet beautiful examples of Mediterranean-style architecture. These abodes were meant to serve as homes for guests who visited the Island and found they never wanted to leave. In fact, they were so closely intertwined with the resort that Sea Island eventually ended up helping with housekeeping, maintenance and more for owners of the cottages. Cottage No. 32 was built in the 1920s. 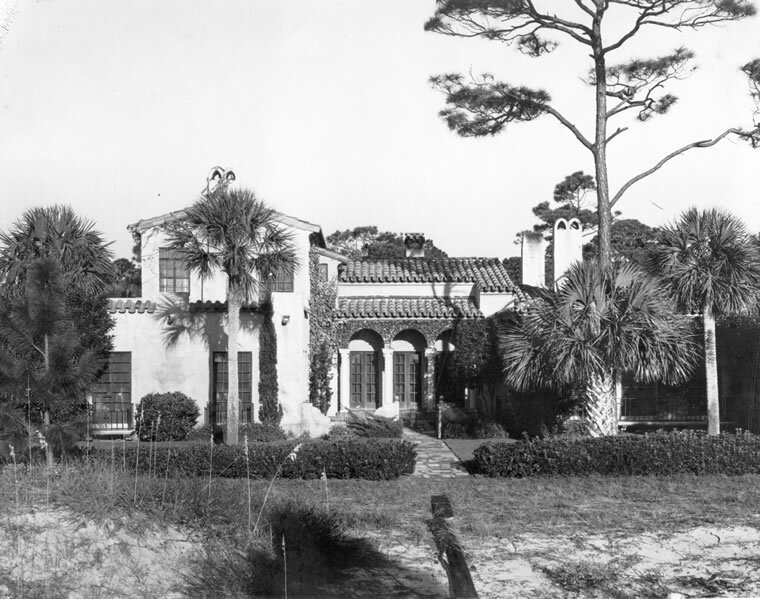 Similarly, when Dr. Peter Holliday purchased his Sea Island cottage, he had no idea that it would be so intertwined with the resort—specifically, its history. His cottage’s first owner was Colonel Tillinghast L’Hommedieu Huston, who bought the property in 1924, two years before Howard Coffin would acquire Sea Island. Huston was one of the first to build on the Island, although his cottage is numbered 32, meaning it wasn’t finished until 31 others had been completed.The cottages are not numbered by location, but instead upon the order they are built. In fact, when it comes to the address, they have an entirely different emergency number listed for local authorities and emergency services to reference in order to be able to locate them. 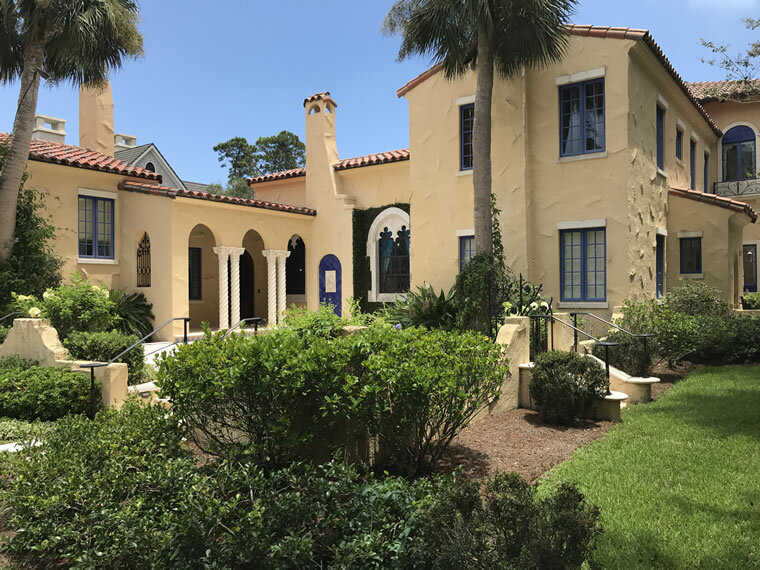 Huston hired architect Cletus Bergen to design the cottage the very same year that famed architect Addison Mizner was commissioned to design The Cloister. In the 1940s, Huston sold his cottage to Frank Horne. Horne in turn hired Francis Abreu to redo his home in 1940; Abreu was also chosen to design additions to The Cloister. Holliday eventually bought the property in 2003. Sea Island Cottages have in the community. While they come with luxe amenities such as concierge assistance and babysitting services upon request, what makes them stand out is how historical they are. Nancy and Milt Taylor were drawn to the sheer diversity of the cottages. Theirs will boast a transitional Tudor-style facade, “a departure from the beautiful Mediterranean-style homes that line many Sea Island streets,” Milt notes. Their cottage is No. 570 and yet to be complete—a glimpse into the future of the cottages at Sea Island. Since those initial cottages in the 1920s, the number of these abodes has climbed to nearly 600. Famous names have owned cottages on Sea Island, including playwright Eugene O’Neill, who wrote “Ah, Wilderness!” in his oceanfront home.